In the deserts of Nevada you'll find the small little town of Rachel, NV. 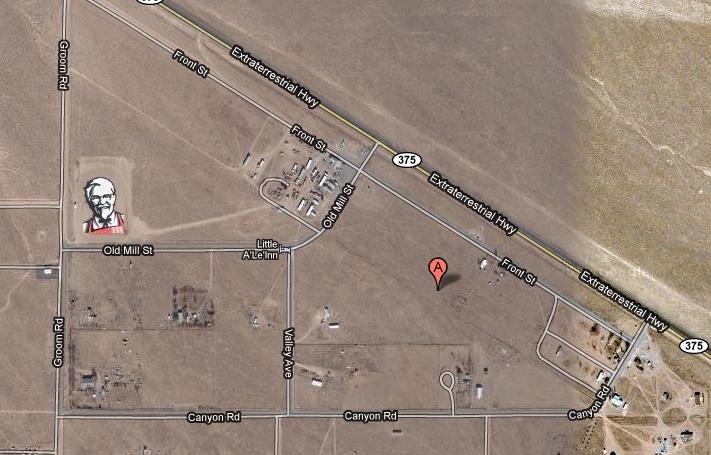 It is best known as the jumping off point for exploration around Area 51 and is home to the Little A'Le'Inn. It is also home, mysteriously, to a giant-assed painting/mural of Col Sanders. Why? Is the Col part of some great alien-fried chicken mystery? Was one of the secret ingredients from another world or even possibly alien meat? Nope, apparently it's an advertising stunt. KFC wanted to have the first ad visible from space, and they apparently got it. You can read more about the ad here. And you can look up the Col yourself on Google Maps by clicking here.